remember last week when i said i haven’t cried very much through this whole cancer season? how i just don’t do it because it makes everything worse? yeah- God called me out on that one. oops. i have cried an average of 2,000 times every day since i shared that my cancer is gone. that seems excessive, even for someone going through treatment. no? you don’t think that’s a lot? fine. it feels extreme to me- my pajama top is wet. (yes, pajamas and zipper tops are the only things i can wear til my surgeon removes my disgusting drain.) it’s not that i don’t have feelings usually, but i don’t uncontrollably leak emotion everywhere. IEP meetings (individualized education program- where we meet with julia’s awesome school team about her progress & goals). i have cried grateful tears at every one of these meetings since she was 3 years old. that’s roughly 20 separate occasions where i have either sniffled, teared up, or bawled in front of a group of 5-10 men and women i barely know. Good Music. 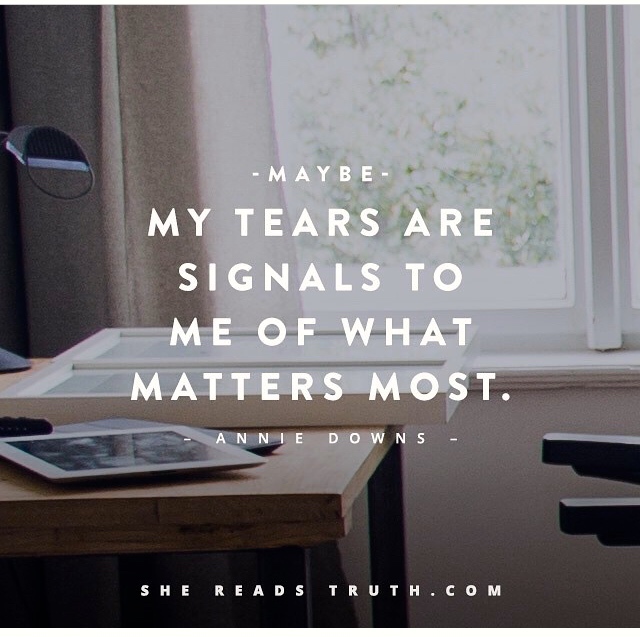 at home, i listen to songs on repeat and sing loudly (not well) and sometimes cry- those tears are Truth making its way into the hard and hidden parts of my heart. at church, i sit with my girls during worship (julia will not allow me to stand, in case you’ve ever wondered why the pastor’s wife stays seated when everyone else in the congregation rises). i look around as i sing, occasionally crying as i long for the Hope and Love we sing to sink deeply into my daughters and into my community. those tears are prayers. Writing. most of my writing is private. it’s chicken scratch- incomplete, incoherent- just splotches of what i’m feeling and learning. sometimes those messy little sentences have big Truth and important Growth in them, and my tears are just more words written in salt water. Reading. crying from anger over injustice, sadness over oppression and abuse… those are hard and necessary tears. books that make me laugh til i cry are my favorite, as long as i don’t also pee. (too much? i wrote about my breasts in my last post, so i’m just on a roll.) every so often, i cry from the words aimed directly at me- either the completion of a long Work inside me or the beginning of an new one. but today my tears are coming from somewhere less familiar, less comfortable. i wrote to some long time friends who pray with me over email… women i know from weathering a decade of storms, celebrating a decade of triumphs, walking together through our everyday extraordinary lives. i cried as i wrote because i miss them. i cried because i feel so intensely for them. i cried because i feel sorry for myself that i am here and they are there… so far away. and then i cried because i need to be sharing those prayers with women here. i know i have people here. our community (all of it- church, neighborhood, school, and town) is an unexpected, unbelievable treasure. i’ve been loved so well and so often by women (and men) who barely know me… meals made, groceries purchased, cards written, prayers lifted, gifts sent, tears shed, hugs given by those who just want us to know they care. you see that we are hurting, and you care and you show it. i know i have you, and i’ve barely scratched the surface of your friendship. the truth is that i crawl away to deal with pain. i go to my hiding place when i’m hurt and scared. it’s warm and soft and safe in here, and it’s only big enough for me. i came here when i was in labor- don’t touch me, don’t talk to me, don’t even move- just let me get through this (or i will rip your head off). i came here when matt had cancer- i can cook, clean, potty train one kid, nurse another, make it through- just let me do it. when i got my diagnosis, i swore i would try to be more open, let others in. maybe i did a little… with those who were already so deeply embedded in my life that i couldn’t get rid of them. (yeah, old friends- i think i just compared y’all to ticks. sorry.) i think i avoided my new friends along with the germs my nurses warned me about each week. (awesome- now i’ve compared my new friends to viruses. i’m a great person, promise.) i think i kept everyone out of my hiding place, out in the cold. a few brave new friends have asked since my mastectomy if i’m ready for people yet. my heart just aches to even think about it… no, i’m still hurt. i’m still hiding. i’m just now feeling how sad i am… how awful this has been and how incredibly afraid i am that this is not over, that i am not ever going to be done with cancer and sickness and hurt. i can’t stop crying… and i guess that means i need people now? NO. i want to do friendship on MY terms, with good wine and vanilla candles and bacon wrapped dates. i want to be cute- wear a pretty outfit that isn’t ‘mastectomy friendly’ and fun earrings that don’t look stupid because i’m bald. i want eyebrows that won’t keep wiping off accidentally because I CAN’T. STOP. CRYING. i don’t want to need to cry on you. i don’t want to not know how to say what i’m feeling, why i’m still scared, still crying. but i do want the friendship that comes from sharing all these tears, all this need. i do want you. so yes- thanks for asking. i think i’m ready for people again. be careful with me… i’m awfully fragile and soggy from all the crying.